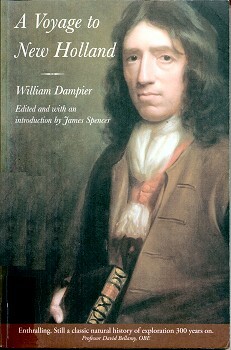 William Dampier : Peru, Australia & New Britain, 1684-1700. 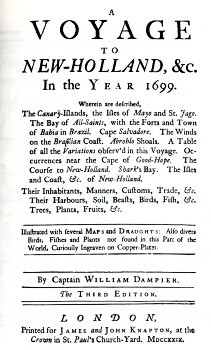 A new voyage round the world : describing particularly, the Isthmus of America, several coasts and islands in the West Indies, the isles of Cape Verd, the passage by Terra del Fuego, the South Sea coasts of Chili, Peru, and Mexico, the Isle of Guam one of the Ladrones, Mindanao, and other Phippine and East India islands near Cambodia, China, Formosa, Luconia, Celebes, &c., New Holland, Sumatra, Nicobar Isles, the Cape of Good Hope, and Santa Hellena : their soil, rivers, harbours, plants, fruits, animals, and inhabitants : their customs, religion, government, trade, & c.
The Indians of Colan are all Fishermen : they go out to Sea and fish for Bark-logs. Bark-logs are made of many round Logs of Wood, in manner of a Raft, and very different according to the use that they are designed for, or the humour of the people that make them, or the matter that they are made of if they are made for fishing, then they are only 3 or 4 Logs of light Wood, of 7 or 8 foot long, plac'd by the side of each other, pinn'd fast together with wooden pins, and bound hard with Withes. The Logs are so placed, that the middlemost are longer than those by the sides, especially at the head or fore part, which grows narrower gradually into an angle or point, the better to cut through the Water. ... bottom of the Float, and of a considerable breadth. The smaller sort of Bark-logs, described before, which lie flat on the Water, and are used for Fishing, or carrying Water to Ships, or the like (half a Tun or a Tun at a time) are more governable than the other, tho' they have Masts and Sails too. With these they go out at night by the help of the Landwind (which is seldom wanting on this Coast) and return back in the day time with the Sea-wind. This sort of Floats are used in many places both in the East and West-Indies. On the Coast of Coromandel in the East-Indies they call them Catamarans. These are but one Log, or two sometimes of a sort of light Wood, and are made without Sail or Rudder, and so small, that they carry but one Man, whose legs and breech are always in the Water, and he manages his Log with a Paddle, appearing at a distance like a Man sitting on a Fish's back. At another time our Canoa being among these Islands seeking for game, espy'd a drove of these Men swimming from one Island to another; for they have no Boats, Canoas, or Bark-logs. They took up Four of them, and brought them aboard; two of them were middle aged, the other two were young Men about 18 or 20 Years old. To these we gave boiled Rice, and with it Turtle and Manatee boiled. ... any thing in it, and when they were, set on Land again, they ran away as fast as they could. Dampier, William : A Voyage to New Holland. The Mill, Brimscombe Port, Stroud, Gloucestershire, GL5 2QG, 2006. Crown in St. Paul's Church-Yard, London, 1729. They are very dextrous active Fellows in their Proes, which are very ingeniously built. They are narrow and long, with Out-lagers on one side; the Head and Stern higher than the rest, and carved into many Devices, viz. some Fowl, Fish, or a Man's Head, painted or carv'd: And though it's but rudely done, yet the Resemblance appears plainly, and shews an ingenious Fancy. But with what Instruments they make their Proes or carved Work, I know not; for they seem to be utterly ignorant of Iron. They have very neat Paddles, with which they manage their Proes dextrously, and make great way through the Water. ... thinking we could run the Ship a-ground any where, as they did their Proes; for we saw neither Sail nor Anchor among any of them, though most Eastern Indians have both. These had Proes made of one Tree, well dug, with Outlagers on one side: They were but small yet well shap'd. We endeavour'd to anchor, but found no Ground within a Mile of the Shore: We kept close along the North-side, still sounding till we came to the North-East-end, but found no Ground; the Canoas still accompanying us; and the Bays were covered with Men going along as we sail'd: Many of them strove to swim off to us, but we left them astern. A Voyage to New Holland. Geoff Cater (2010-2104) : William Dampier : Canoes in New Britain, 1700.